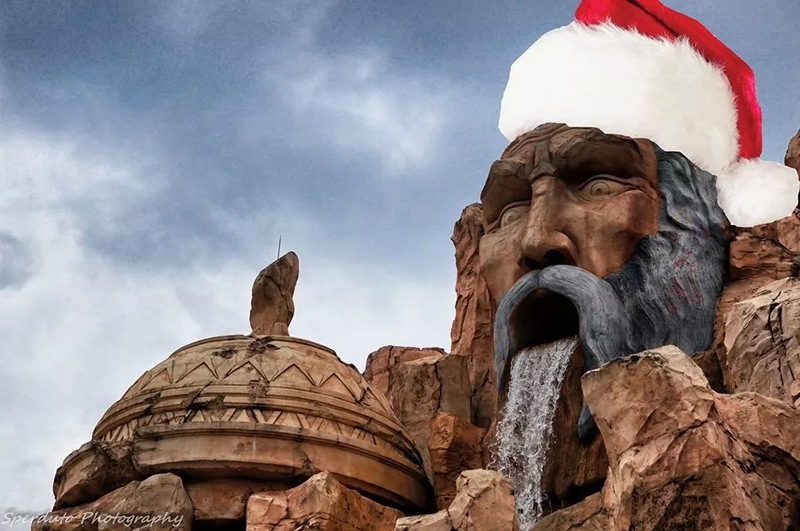 Welcome to the first ever installment of If I Ran The Theme Park. 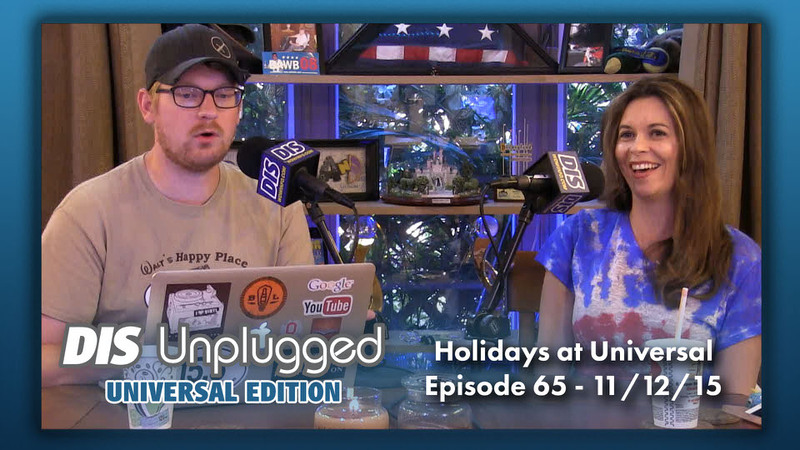 Today, we are going to look at holiday decorations at the Universal Orlando Resort. We can all agree that Universal has been firing on all cylinders lately. 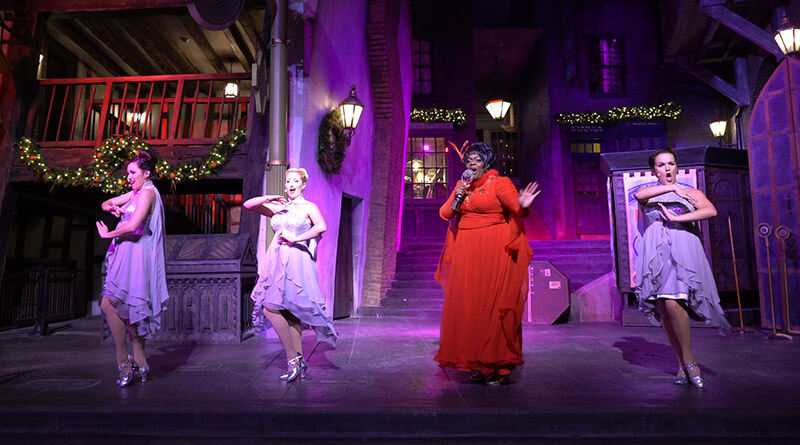 Within the last year they have delivered an incredible value resort with Cabana Bay, the first ever attraction that travels between two separate theme parks with the Hogwarts Express, and the new Gold Standard of immersive theme park lands with Diagon Alley. 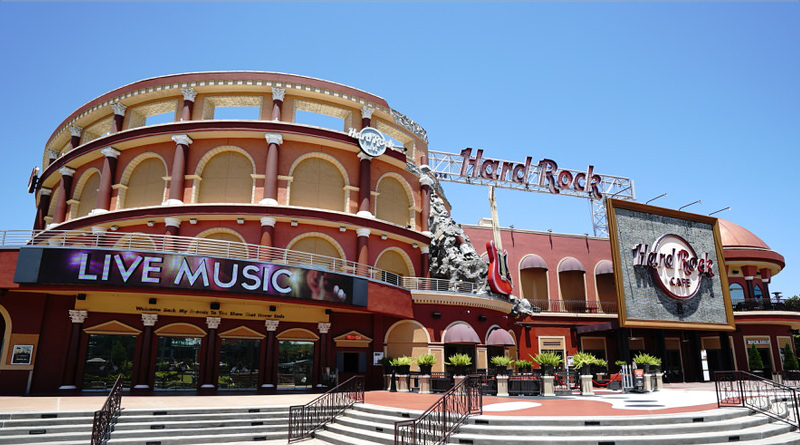 They have also completely redone CityWalk with several fantastic restaurants, including the newly opened Cowfish. 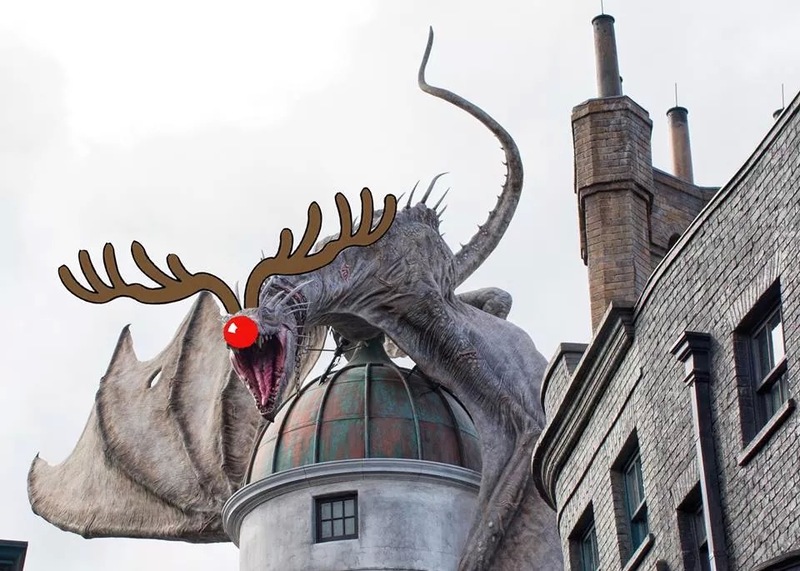 However, one area where Universal doesn’t over deliver at is decorating the parks for the holidays. 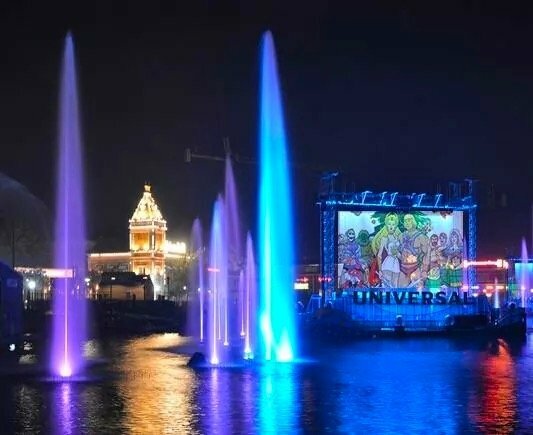 While many theme park fans get warm and fuzzy walking down the decorated Main Street USA in the Magic Kingdom, or pick their jaws up off the ground while seeing the Osborne Family Spectacle of Dancing Lights at Hollywood Studios, most will agree that Universal could use more decorations across both their parks. 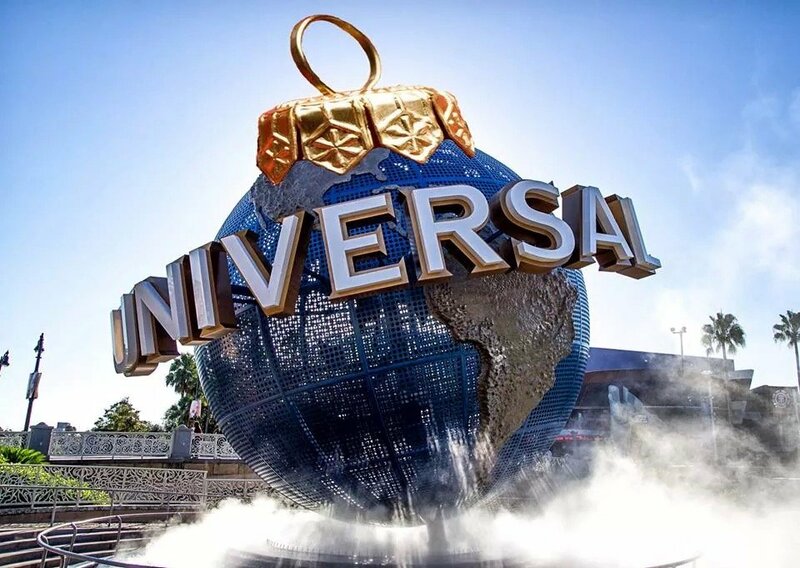 The Universal Globe Ornament – Sitting in front of the entrance to Universal Studios Florida, the Universal Globe is an iconic photo-op for every Universal guest. 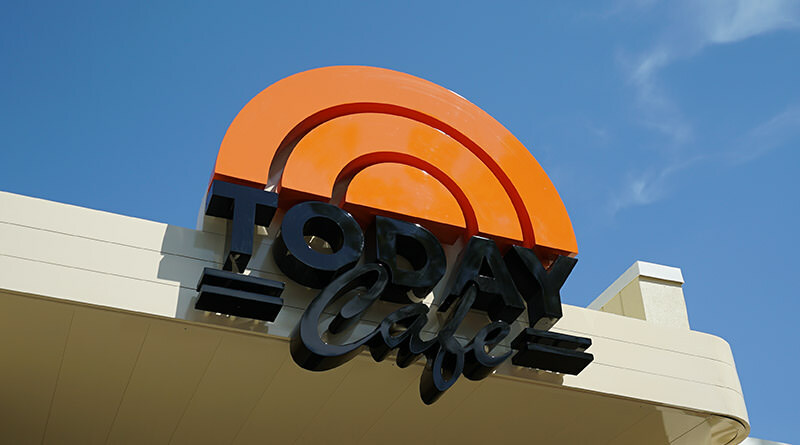 Who among us hasn’t said, “Hold on a second, waiting for the word Universal to come around…”? Now, with just a small addition, this globe becomes the perfect Christmas tree ornament. Looks like the tree in front of 30 Rockefeller Center lost one of their ornaments. 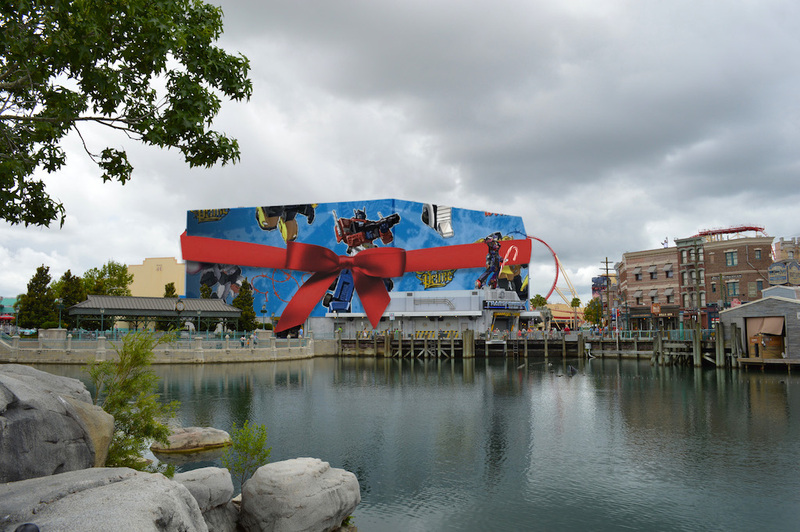 Transformers: The Ride 3-D – One of the only complaints that guests have had with the amazing Transformers ride is that the show building just looks like “a big gray box.” Well, let’s turn that box into the world’s biggest Christmas gift! 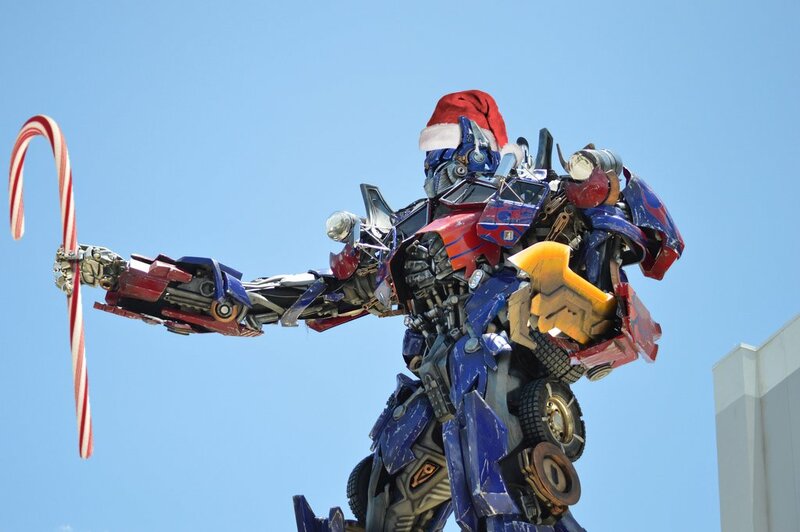 Optimus Prime – Standing 30 feet tall and holding a 10 foot candy cane…you’re gonna need a bigger chimney for this Santa to come down. 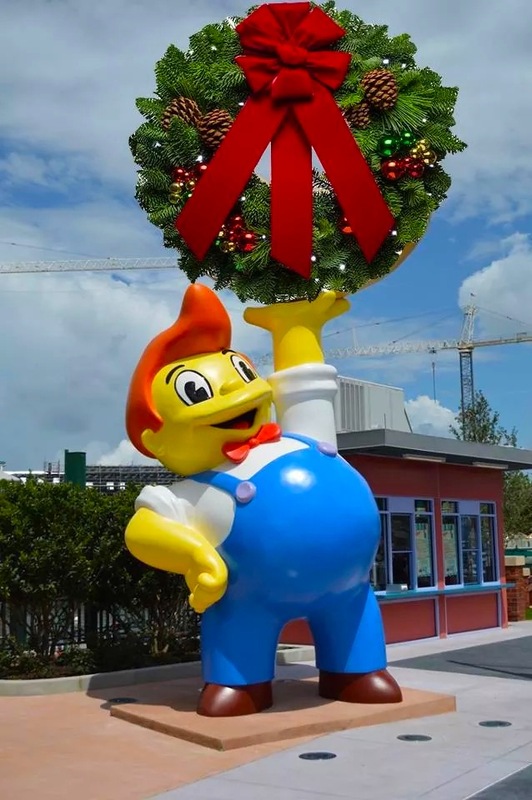 Lard Lad in Springfield USA – Replacing Lard Lad’s signature pink donut with a Christmas wreath is just part of the fun holiday overlay for the Springfield area of the park. Duff Gardens will serve egg nog, Krusty Burgers will be made with “reindeer meat,” and the Kwik-E-Mart will offer a special Black Friday Sale, featuring 0% off. 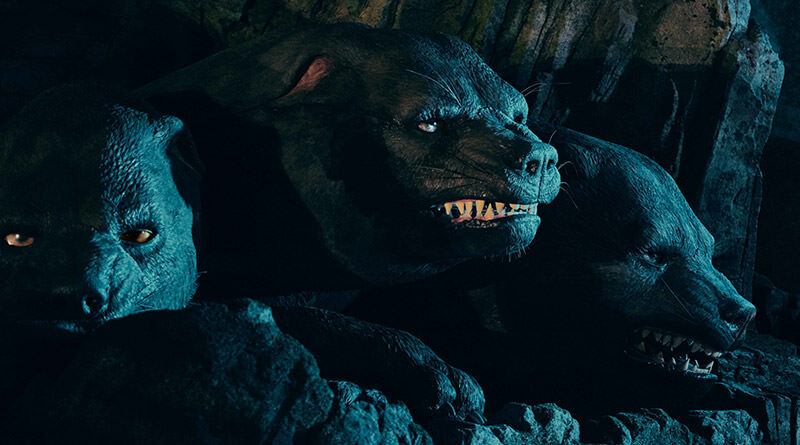 The Gringotts Bank Dragon – We’ve got the open fire, who’s got the chestnuts to roast? 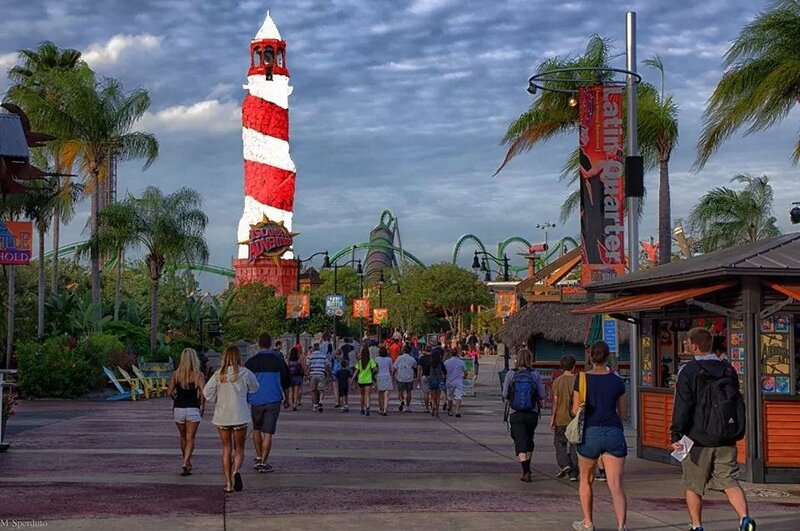 Islands of Adventure Lighthouse – Meanwhile, over at Universal Orlando’s second park, Islands of Adventure, the park icon will be converted over to “The North Pole,” alerting guests across property that a Christmas celebration is taking place. Finally, something worth looking at from the Orlando Eye. 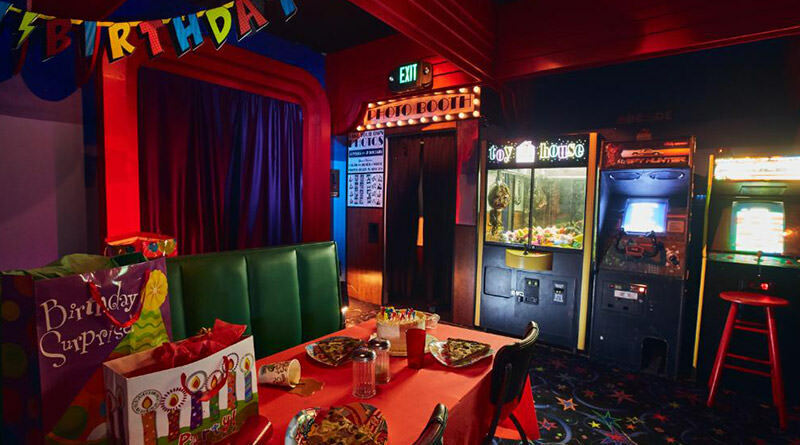 Mythos – During Halloween Horror Nights, Mel’s Dine-In at USF is cleverly converted over to Mel’s Die-In and over in IOA Mythos will be redubbed MytHO-HO-Hos for the holiday season. 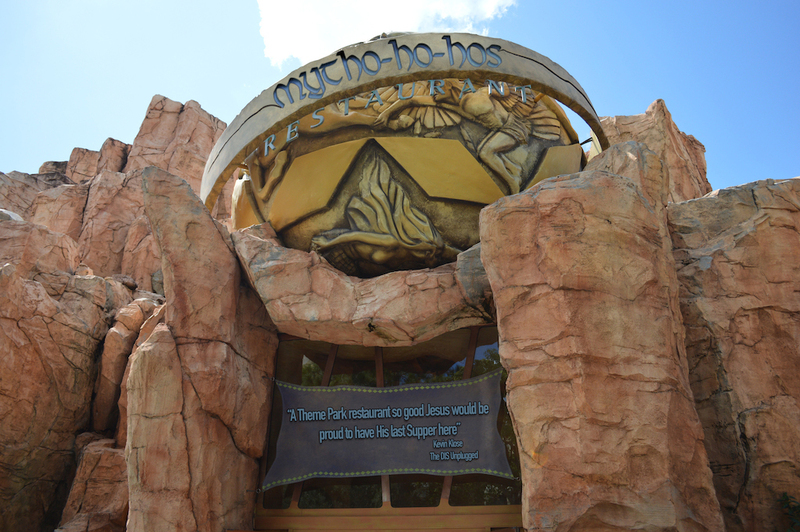 Mythos, Islands of Adventure’s signature restaurant. But that’s not all! 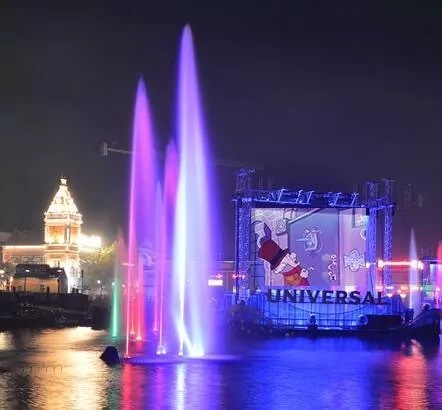 During the Christmas season the Universal Cinematic Spectacular nighttime lagoon show will switch from playing clips of popular Universal movies, to clips of animated Christmas movies including He-Man & She-Ra: A Christmas Special, Mr. Magoo’s Christmas Carol, Yogi’s First Christmas, Shrek the Halls, and more! Matt Cleary majored in Photoshop and graduated with honors from South Central Louisiana State University. Cleary attained some fame in the late ’70s while working for SeaWorld as an engineer. He was the one who finally figured out how to design a tank for Shamu. His solution? 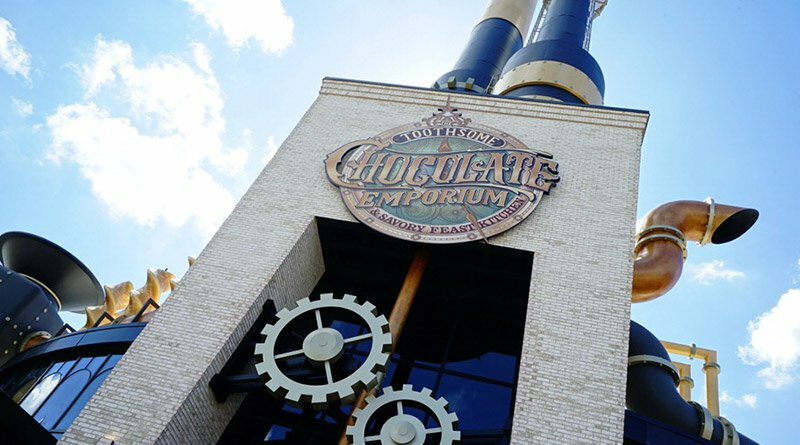 “Take a regular tank and make it bigger.” That type of out-of-the-box thinking has kept him as a key figure in the theme park industry. His prized possession is a birthday card signed by Walt Disney himself, a card he bought at Theme Park Connection in Orlando last October. Mike Sperduto is the first ever Lego construction to become sentient. Living in southern Florida, Mike spends 99% of his days enjoying life with his beautiful wife Jenn and three wonderful daughters. 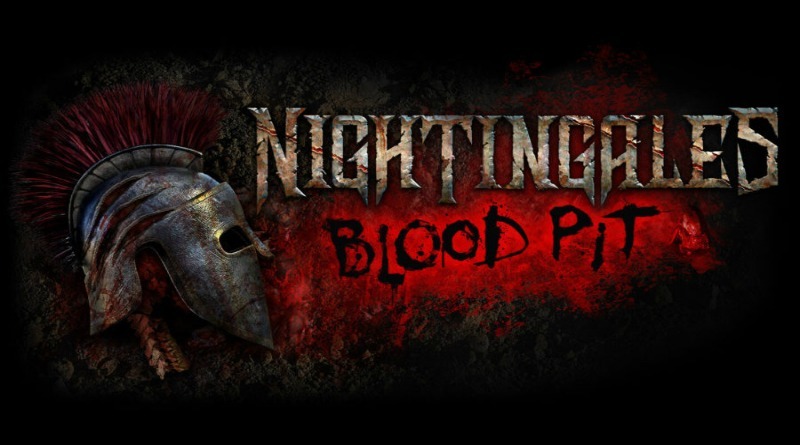 The other 1% is spent daydreaming about Universal’s Halloween Horror Nights. Derek Burgan, a celebrated two-time runDisney medal winner, has been herding cats since 2001. He can be seen setting the world record for amount of mix-ins to a Menchies FroYo, training for the three legged race at the Summer Olympics with ace photographer Brandon Glover, and co-hosting the award winning podcast Pardon the Pixie Dust.